Chief, pictured on the left, has a prayer group/bible study that he leads each Wednesday at 1 pm. 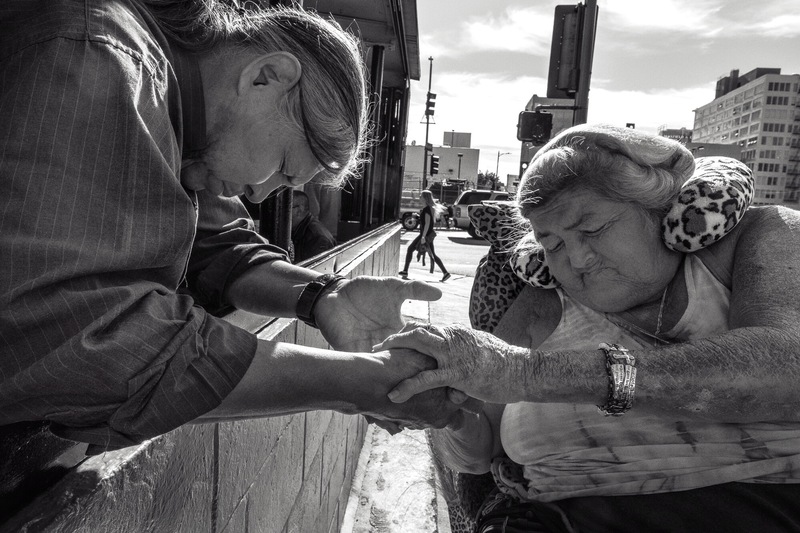 I’m always hoping to grab a few pictures of the earnestness and sincerity that I see and feel as I stand on the sidelines, as observer and, in some ways, a stranger. The meeting place is at a worn, downtown grill, a Skid Row version of a diner you might find in New Jersey somewhere, with outdoor seating and a little window to place your order, the menu displayed in pictures plastered on the walls around the pick up window. Lots of egg dishes, bacon, toast, burgers, Mexican food, fried platters. People sit each Wednesday with bibles in hand, taking turns, some reading aloud from their bibles with difficulty, others with fluidity and confidence. Chief gives each person a copy of his enviably legible, thoughtfully handwritten bible passages/lessons for the week. People are faithful visitors, returning most weeks to sit in peace, read the Bible, and have a lunch from the restaurant’s little kitchen paid for by a generous, anonymous donor. This anonymous donor also provides bibles for those who need them, high quality and durable, and presented to each new owner in a box. Chief and Gloria are two of the most sincere people I’ve met in my adult life, and they will remain in my memory forever.